Did you plug a USB drive into your computer yesterday, but today it doesn't show up? Yet that drive works in the other USB ports on your computer. The problem may be the port! This is one of those computer issues that happens so rarely, we tend to blame the USB drive itself; just plug it in somewhere else and carry on. However, USB devices are still on the rise in popularity and show no signs of slowing down. 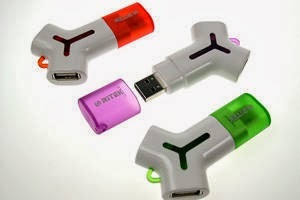 USB flash drives, USBgers for your phone, USB to connect your iPod, USB coffee warmers, USB is everywhere! So you NEEDyour ports working. Here's what you can do to check out your USB port and some tips on fixing it. The first thing that you want to do is to see if the USB port is physically damaged. A simple test is to put your USB Flash Drive into the port and see if it wiggles up and down really easily. Be gentle doing this! You don't want to create a hardware problem if you don't already have one. If you're not sure how sturdy the USB port should be, do the same thing in a port that you know works and compare the two. If it is definitely loose, you'll probably want to move right to the end of this articlewe talk about dealing with USB port hardware issues. If not, follow the steps we have here. Before you get carried away with Device Manager, try the old tech support standby - turn it off and turn it on again. Sometimes that works by forcing the operating system to scan for hardware,the USB port, and makes it work again. If that doesn't work, then it's time to get into Device Manager. This might not make much sense to you, but there is some useful information here. Seeit says Intel(R) 5 Series/3400 Series Chipset Family USB Enhanced Host Controller? That is the specific type of USB Host Controller for my computer. The key words are USB Host Controller. Find those in your Device Manager. If you cannot find any, this may be our problem. Click on the Scan for hardware changes button in the toolbar. You can see it highlighted in the image below. This will force your computer to check of your hardware again. If you're lucky, this will pick up the USB port, and you'll see a USB Host Controller in the list. If not, then the problem isn't fixed yet. Scan for hardware changes:here, things get a little tougher. You'll still be working in Device Manager for now. If you are working with a desktop computer, with your mouse and keyboard plugged into USB ports, you may need to manually force a restart with the following steps. Uninstalling the USB Host Controllers will disable your USB devices. Uninstall USB host controllers: Click on Uninstall. Repeat that process for any remaining USB Host Controller. Now restart the computer. This will force the computer to poll for these controllers and, hopefully, pick up the one that isn't responding. While you're in the Device Manager, did it seemthere were an awful lot of devices installed that might no longer be in your computer? Sometimes the drivers stay lingering on your computer, long after the device is gone. This is a good time to clean those out, and we have just the article on easily removing old driversWindows. Did that work for you? No? Let's go deeper then. Disable Selective Suspend feature: The USB Selective Suspend Feature is a power saving setting in Windows. What it does is suspend power being sent to a USB device, in order to save battery life of the computer. This is a good feature in theory, but on rare occasions the feature does not wake up the USB Device. If that's the case, then it would appear that your port is dead. You can disable the USB Selective Suspend Feature through a registry key. It's a good idea to do this on any computer that always has power to it, such as a server or desktop computer. You might not want to do this with your laptop, but if you do, you'll be able to turn it on again easily. Registry Editor: Navigate to the Disable Selective Suspend key by clicking on HKEY_LOCAL_MACHINE, then SYSTEM, then Current Control Set, then services, then USB.it says Disable Selective Suspend in the right-hand window, right-click and click Modify. In the Value Data field enter the number 1. This will disable the selective suspend feature and power will go to your USB ports constantly. If the USB key doesn't exist in your registry, it's easy to create it. Just navigate to the services key, and in the toolbar click on Edit > New > Key. Call it USB. Edit New Key: In the USB key, right-click in the right-hand window. You'll only have the New option. Click on that and DWORD (32-bit) Value. It may just be called DWORD Value on your system. Name the new value Disable Selective Suspend. Just above, right-click and click Modify. In the Value Data field enter the number 1. There! You have disabled the selective suspend feature. You may need to restart your computer for the setting to be applied. This is a good time to mention that if you ever feel the need to block your USB ports working, there is a tool to help with that. It's called USB Manager and we have a short article on how it works. Is your dead USB port working now? No? Then you might well consider that the USB port is physically damaged. Fix damaged hardware: If it's still not working, it may very well be a hardware issue. USB ports are pretty fragile and USB Flash Drives can act as levers on them, wreaking havoc on the electrical connectors inside. This is seen very often in laptops,the user will pack up the laptop and not disconnect the USB Flash Drive. It can usually be fixed. There are several ways to try to repair your USB port. Hopefully, it's just operating system or driver related as that's the easiest and cheapest fix. Don't dismay if it is a hardware problem - those can be fixed fairly simply and inexpensively too. The point is, it can be fixed.